(RED OAK, TX) April 25, 2017 – Life School, a leading North Texas charter school serving over 5,500 students, held its 2nd annual Gifted & Talented Expo at its Red Oak campus on April 21st. 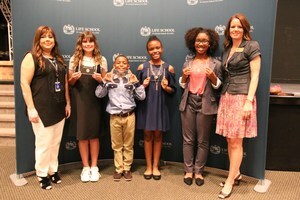 Eighteen 3rd – 6th grade students in the Gifted and Talented Program from all five of Life School’s elementary campuses competed for the title of “Humanitarian of the Year” at each grade level. Each of Life School’s more than 100 Gifted and Talented Program students in grades 3-6 have spent the 2016-2017 school year researching various aspects of developing countries, including their infrastructure, innovations, energy supplies, as well as specific organizations that serve these nations. Students then formulated and delivered their ideas into a formal presentation. The finalists advanced through two rounds of presentations at the campus level to earn their spot at the district competition where they presented to a panel of judges. The panel gave feedback and asked questions, which allowed students to show their expertise and knowledge related to their area of study. “We are so honored to know that the hard work that Life School’s Gifted and Talented students have put forth this year will make life better for people all around the world,” said Ellen Saltzman, Life School District Gifted and Talented Coordinator. The four district winners also will have the opportunity to make a donation in their name from Life School to an organization of their choice that supports humanitarian efforts in the country they studied. Photo: Back row (left to right) are Yvonne Carroll, Life School District Gifted and Talented Teacher; Naysa Watson, 5th Grade, Red Oak; Nikolas Gilbert, 3rd Grade, Lancaster; Raven Allen, 4th Grade Lancaster; Christin Merrell, 6th Grade Lancaster; and Ellen Saltzman, Life School District Gifted and Talented Coordinator. About Life School Life School opened as an open-enrollment public charter school in 1998 and has campuses in Oak Cliff, West Dallas, Cedar Hill, Lancaster, Red Oak and Waxahachie. For eight consecutive years, Life School has received the Texas Education Agency’s highest rating in School FIRST (Financial Integrity Rating System of Texas), a financial accountability system for charter schools. Life School’s mission is to train leaders with life skills for the 21st century by establishing strong academics, character training and a parenting program.